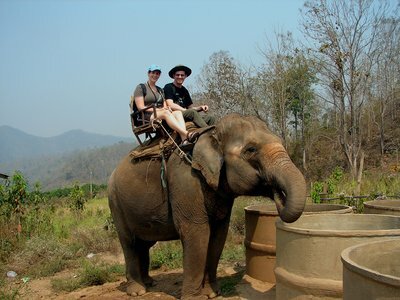 Did I mention taking an elephant ride in Chiang Mai a couple of weeks ago? I don’t think I did. We got to Chiang Mai early in the morning and while some of the group went off to a cookery class, Rae and I took a minibus to an elephant reserve outside Chiang Mai. We spent about an hour perched on top of a balding forty-something elephant as it strolled around the nearby landscape. It’s not a comfortable way to travel, and it was unbelievably hot. We had both pointlessly brought rucksacks with us, as well as cameras. We had bought bunches of bananas too, to feed the elephant. I ended up covered in banana as the bunches disintegrated in my lap. Elephant power consumption must run well into the kilowatts, so they can eat an endless number of bananas. They also get through 40 or 50 kg of feed a day. Elephants are a bit of a problem in Thailand. They used to carry loads, provide power, and function as tanks in battles; now all that is done mechanically. You see small elephants sometimes in the streets of Bangkok and Chiang Mai. This is, obviously, not their natural environment. 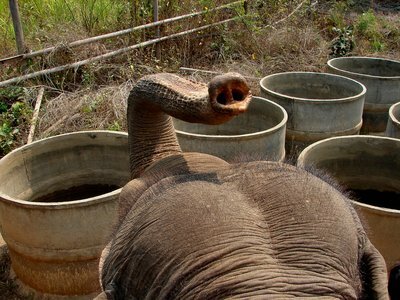 Their keepers ask for money for the elephants, but then abandon the elephants when they get too big. Inevitably, these abandoned elephants cause problems. So the advice is not to give to these people. Quite often our elephant would stop and lift its trunk, demanding bananas. So long as we had any, Rae would oblige. It was a long reach forward. Occasionally the elephant would stop altogether and trumpet. There are all sorts of words for elephant in Thai, for immature female, mature female, mature male and so on. The only one I can remember, other than Chang (which is a brand of beer with a picture of an elephant on the front) is Phan, an immature female. 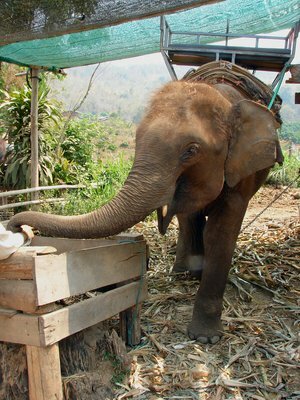 This is Phan Dii, an 8-year old female. The H’mông arrived in waves between 1700 and 1900, pushed out of China by the Han. 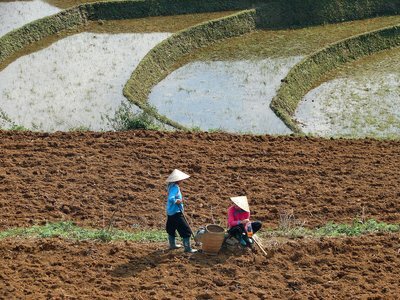 They were, and are, wet rice farmers cultivating flooded paddy fields. 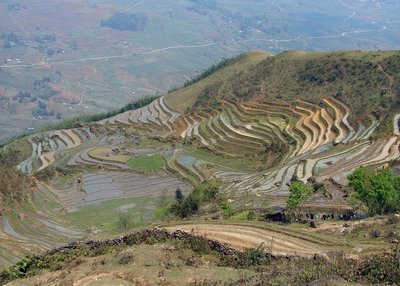 Their land in Vietnam is far from flat, so they had to construct terraces. They have terraced the entire landscape around here. 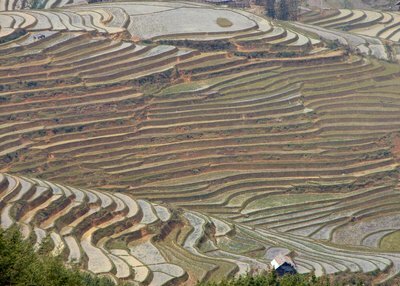 The valley beneath Sapa is like a living contour map. It is an impressive achievement. It’s tempting to take a lot of photographs of this orthogonal world. I took these photos during two walks with Matt, the first to Càt Càt, the second from Cầu Mây to Tả Van (I hope all the diacritical marks are appreciated). Càt Càt, a H’mông village, is 3km below Sapa. 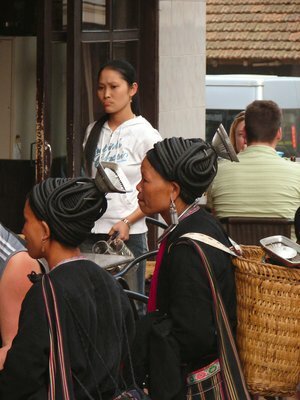 A couple of H’mông girls walked along with us, one each, trying to sell us bracelets and mouth harps. They gave up after a mile or so. At Càt Càt we walked down a steep path to a bridge where we found the remains of a French hydroelectric power project, and a non-functioning waterwheel (it’s dry season). Then we climbed up beside a waterfall and looped back around. 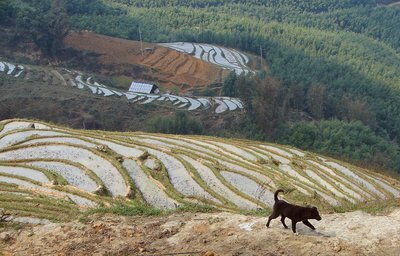 We saw: children, pigs, dogs, chickens, water buffalo, terraces. The walk was just long enough for us to discover the inadequacy of the 1:75000 tourist map. 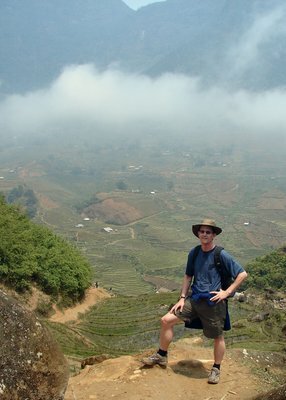 Undaunted and unintelligent, we planned to walk 17km up the valley back to Sapa the following day using just the map. It didn’t work, of course. We took a motorcycle taxi each down the valley to Cầu Mây easily enough. I hadn’t been on a motorbike since I was about seven and didn’t enjoy the ride much, although the views over the digitised valley were lovely. The sensory package was not helped by the stinking helmet. At Cầu Mây the river is crossed by an old rattan bridge and newer steel suspension bridge. The rattan bridge would not have been worth travelling to see, had it been the sole objective. 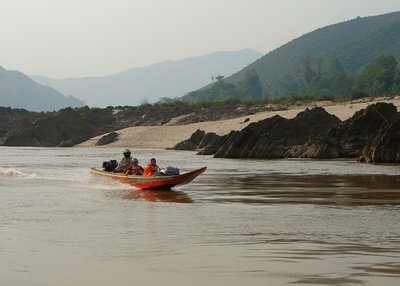 As we left the main road to descend to Cầu Mây, we were again picked up by two H’mông girls. Mine was called Chu and was nine years old. The other girl was extremely shy and we never found out her name. Chu was unshy; indeed, she would not shut up. Unfortunately, the conversation was limited. Repeat 100 times (no exaggeration). The children around here are equally proficient in English and French. It is easy for them to learn, of course. Some of them are quite good. In between (although usually before) the incessant “You buy from me?” requests, there are also genuine questions: “What your name?”; “Where you from?”; “How old are you?”; “You got wife?”. Always with a smile. These are probably both preludes to a sale – establish contact, then try to close – and genuine questions. Everyone in SE Asia asks the same questions (also, sometimes, “How much you earn?”). There are a couple of H’mông girl-women around town who always say hello: Xo and Dzao (no idea about spelling). Chu and her friends gave up shortly after we crossed the river. We headed left for half a mile to Giàng Tả Chải (pronunciation: no idea). 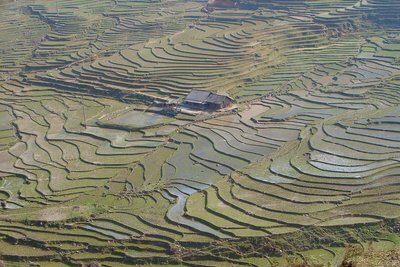 It is supposed to be a Dao village. But when we got there, it seemed to be deserted. There turned out to be one old lady sitting in the sun, who offered to sell us stuff when we approached. Everyone else was at Sapa. Even when we thought we had eventually reached the top, we hadn’t. Eventually, we faced a choice: carry on up, possibly even up to Fansipan, or down a path to a couple of farmhouses. We plumped for down. After scrambling down between paddy terraces we reached a couple of huts. We asked for directions for Sapa and the lady pointed up. Then she pointed down. Hmmm. We tried to carry on down, but our way was blocked by some territorial dogs (even a scratch here and it would be back to Hanoi for some rabies injections). So we picked our way around an amphitheatre of terraces on a path next to a wall. When that petered out we resorted to walking along and up the paddy walls themselves, not designed to take people of my mass. We had lunch at a local maximum next to a bamboo grove and then faced the fact that we had made the wrong choice, so we headed straight up another 200m or so, and finally reached a wide track, which wound down over a couple of miles or so to Tả Van. Tả Van is supposed to be a Dáy village, but it was difficult to tell. Tả Van was nothing special; everyone was selling tat. There was a substantial school and some other civic buildings, so the village is doing well. At this point Matt estimated we had climbed 800m or so, on very difficult terrain. We were tired and mistrustful of the fictions on our map, so we called it a day and took motorbikes back to town. All this, of course, is just a transparent excuse to insert some pictures of terraces. I’m on my own. Matt headed off to Ha Long Bay the day before yesterday. He had a chest infection and didn’t feel up to climbing Fansipan. I was temporarily bereft: I hadn’t had to think for myself for two and a half weeks. I avoided the need for autonomous action by staying in Sapa. The decision was made even easier by the fact that I have eaten very well here. I found a hotel that costs $10 a night. The room is up under the roof, and I like it. It is at least 100m above town, so even walking to and from the hotel works the legs. The hotel has a little garden with a swing bench overlooking the Sapa valley; this is where I hope to reduce my book surplus. Unfortunately, a wet fog has rolled in today, so the swing bench has no view, and the temperature has dropped. There is nothing to do but read, blog and eat. Or try to learn Vietnamese. I thought Thai was difficult, because it’s a tonal language, but Vietnamese seems much harder. I have got nowhere. Vietnamese has six tones compared to five in Thai. Unlike Thai, many of the vowels and consonants are extremely difficult to pronounce. I was talking to two Vietnamese yesterday at dinner called Vượng and Nguyêt); hard as I tried, I couldn’t get near to pronouncing Vượng’s name correctly. Then there is the spelling. Vietnam was under the control of China for a thousand years until 939 AD. Two-thirds of its words derive from Chinese. Vietnamese was written in Han Chinese or in an adapted Chinese script called chư nôm. In 1910 the French imposed roman script using a system called quôc ngư. This system was invented in the seventeenth century by Alexandre de Rhodes, a French Jesuit missionary. Unfortunately, he must have invented it one Friday evening after he’d been at the Benedictine, because the letters bear little relation to the sounds. Then there are regional differences… That’s why I’m blogging today. I am a millionaire. I have just taken two million dong out of the ATM. Sadly, this is worth less than £70. The largest note I have seen is VND 200,000, worth about £6.60; the smallest VND 500, worth less than two pence. (A 500,000 note is said to exist.) The larger notes are made of plastic and the government intends to take the older cotton 50,000 and 100,000 notes out of circulation by September. Dong means copper. In the north, the dong replaced the French Indochinese piastre at par in 1964. It was revalued in 1985, and Vietnam suffered high inflation immediately afterwards, lasting well into the 1990s. I’ve been here before: Peru in the late 1980s and Russia in the early 1990s. But the zeros are still mind-boggling. The Vietnamese ignore the last three digits when quoting prices. I got the story of Sapa wrong the other day. 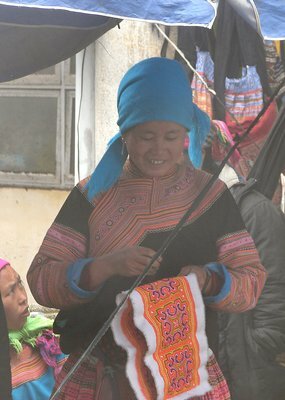 When China invaded in 1979, the fabric of Sapa was not affected. The Viet had to get out of town for a month or so. That’s it. The American war was different. The Americans flattened every building in Sapa. I'm not cut out to be an historian. I now understand it was the French who flattened the town. In 1898 the first French missionaries arrived in Lau Cai, 30km down the road. In the same year Paul Doumer, the Governor General of French Indochina, asked his people to find a place to be used as a convalescence station for French soldiers. Lots of French troops were stationed in Lao Cai, as it was a strategically important border town. In 1903 a military station was established up the road in Sapa. 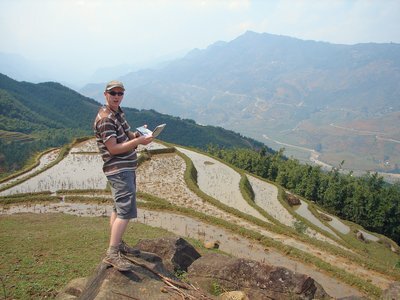 In 1912 the Lao Cai-Sapa road was built, which kick started tourism. The first hotel was built the same year. Fast forward to 1950, when the Viet Minh captured Sapa. The French destroyed all the villas before leaving. And in 1952 they sent bombers from Diên Biên to bomb the town. Source: Sa Pa in the Midst of Clouds, by Pham Hoàng Hải. 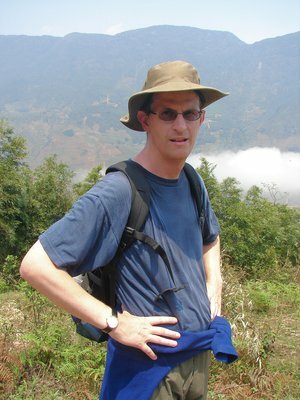 In my nul points review of the border town of Lak Sao I forgot to mention our school visit. After wandering through a market, and after a seven-hour minibus journey I was knackered and hardly up for it, but it turned out to be quite fun. There were a couple of schoolrooms next to a sign saying Anglo-Vietnamese Club, or some such. Rae and I went into one room and Izzy, Marla and Matt into the other. Rae and I introduced ourselves and wrote on the board: name, country. Children of all ages. I got blanks looks when I said angkit (England) so I drew a map. Both the British Isles and Laos looked to me like phalluses, so I moved on quickly. Then we split up and I ended up talking to four people, of whom one, a 12-year-old girl, was by far the most talkative. Her little sister talked quite a lot too, the older ones behind very little. They had been learning for five months and had almost no oral comprehension. I tried to concentrate on pronunciation: Laos learn English from other Laos, and the pronunciation of Englao bears no relation to my mother tongue. Then we were asked to sing a song. My mind went completely blank, so I just sang a little bit of Jingle Bells and then the national anthem, operatically, fortissimo, together with made-up gestures. An improvement on the real thing. Then I asked them to sign the Lao national anthem. Mistake. It went on for minutes with no discernible tune. Every child knew it by heart; they sing it at school every Monday. We don’t even know the second verse of God Save the Queen. On the muzak here at Baguette & Chocolat is “Oh my love" by Westlife. I couldn’t say whether it is the original, if it was an original; most tracks out here are covers. The only reason I recognise it is because we were treated to a solo rendition by one of our guides in Laos, Thuy. He also sang the Celine Dion song from Titanic. He had an acceptable voice but no taste in music. Not only is Fansipan the highest peak in Indochina, at 3143m or so, it is the easternmost peak of the Himalayas. I don’t think I’m going to get to climb it. There is a scene fairly early in Star Wars Episode IV in which Obi Wan Kenobi uses the Jedi mind trick: “These aren't the droids you're looking for”. (I would say "I have already paid for these drinks.") This is not relevant, but it's a great scene. Shortly afterwards, Luke and Obi Wan are in the Mos Eisley Cantina on Tatooine. The bar denizens display a wide diversity of morphologies, even more so in the digitally remastered version. 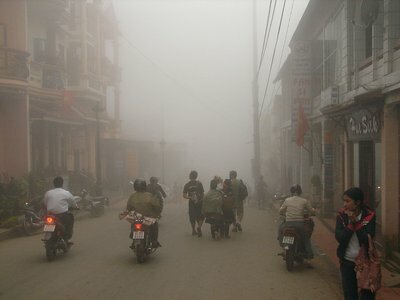 Walking through the streets of Sapa is a bit like that. 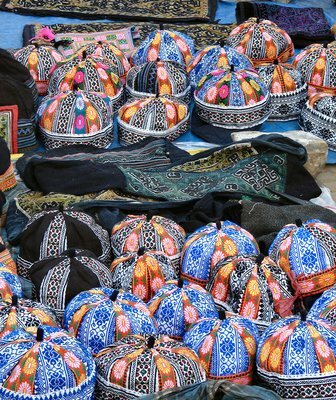 Many people come from surrounding villages to sell in the markets and to sell to tourists. Although they wear jeans and T-shirts in their villages, they dress up to go to market, so there is more outlandish gear than a Star Trek convention. 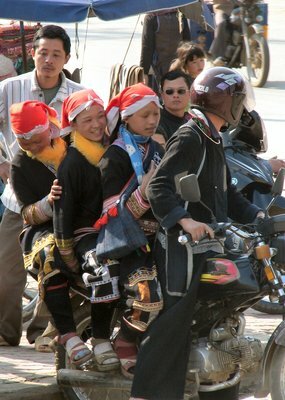 Most of the people you see in Sapa are women; the men are working on the land or driving xe om (motorcycle taxis). 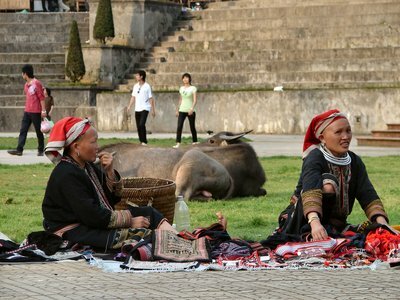 There are officially 54 ethnic groups in Vietnam. The Viet, or Kinh, make up 86% of the population. They are most concentrated in the deltas, coasts and midland regions. Their language is part of the Austroasiatic family. But in Sapa they account for only 15% of the population. 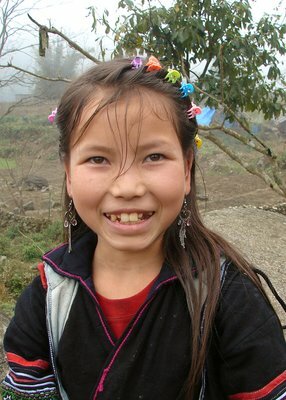 In fact a lot of the young children and old people around Sapa barely speak Vietnamese. 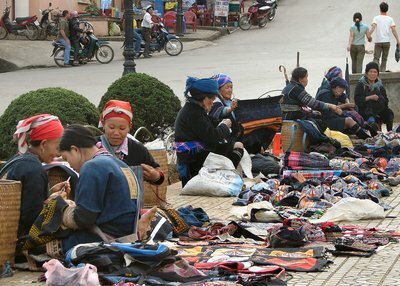 There are about 20,000 H’mông people in Sapa, 53% of the population. The H’mông-Yao language group has 8 million people, spread across Vietnam, Laos, China, Thailand and Burma. The H’mông make up 6.5 million and the Yao 1.2 million, and in Vietnam they are almost entirely in the mountains in the north. They were originally dry rice cultivators but are increasingly wet rice growers, especially the H’mông. They also grow maize, hemp, cotton, vegetables and opium. The last makes them unpopular with the government. The men wear sleeveless vests with long flaps. Often they sport a skull cap, but more often than not in Sapa they are wearing motorbike helmets, because all the xe om riders seem to be H’mông. 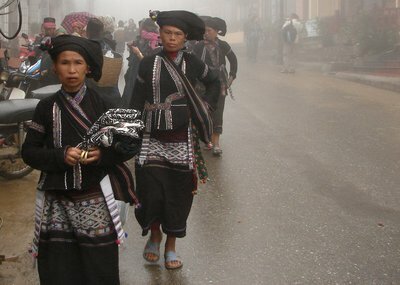 The H’mông women wear black clothes dyed with indigo, and usually a black pork pie hat. They wear sleeveless jackets, coated with beeswax, and long shorts and gaiters, leaving the knees bare. They wear huge crescent-shaped earrings. On wet days they wear purple or green wellington boots. Each carries an umbrella, making them look at times like miniature Mary Poppinses. The tourist office is currently showing a good exhibition of photographs and commentary, all done by H’mông girls. It was previously shown at the ethnology museum in Hanoi. The exhibition makes clear how much tourism has changed the way of life of locals, women and girls especially. 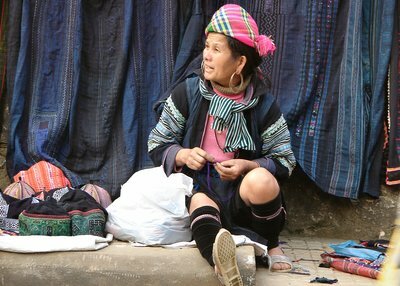 They now spend most of their time in Sapa selling to tourists, and many aspire to work in hotels. Grandparents are left at home to look after the very small ones, and to cook. 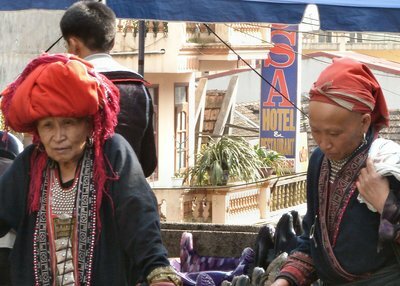 The downside is that it is impossible to walk down the street in Sapa without being asked twenty times to buy some trinket or other: “You buy from me?” they all ask. Other than the bracelets what they are selling is not tat on the whole, but it is not stuff I want to buy: bracelets (cloth and metal); purses; cushion covers; blankets; sometimes, marijuana and opium. It is rather wearing, but they are all just making a living after all, and since there is no aggression in the sales pitch and it's always done with a smile, the only thing to do is to smile back and decline as politely as possible. Twenty times. Any westerner who looks like buying something attracts clouds of sellers. Most of the Montagnard women are minuscule: well short of five feet tall, and probably about five stone. So as the westerners drift Brobdingnagianly down the streets, they look like tankers surrounded by tugboats. 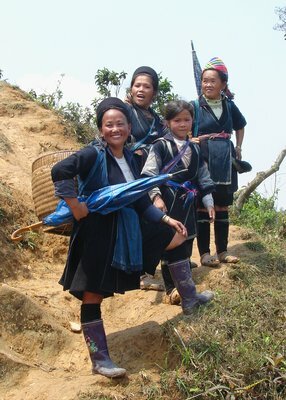 The main groups of H’mông in Vietnam are Black H’mông, White H’mông, Blue H’mông and Flower H’mông. I don’t know how to tell them apart. But the H’mông themselves can tell the commune, the village and often the family of the wearer by looking at the pattern of embroidery. In Sapa they are almost all Red Dao. The women are easy to spot because they wear scarlet headdresses. They usually shave their foreheads and eyebrows. They wear long dresses with open fronts, and two lines of large silver buttons. The front flaps are embroidered with white or yellow thread. The headdresses vary. Old women wear a scarf the size of a bag on their heads. Girls wear a red cloth. Married women can wear red cloths with tassels, or strings of silver coins, or several layers of hems. They also wear a lot of jewellery. A woman may wear silver weighing several kilos and costing 5-7 million dong. Men wear a short jacket with a piece of rectangular embroidery on the back. They can wear black turbans. The women also wear the embroidery square on the back. The square is called the “imprint of King Bàn Vương”. They believe that they are descended from this king, who was as it happens a dog-dragon. 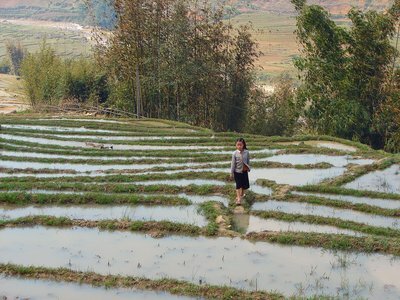 The Dao traditionally grow dry rice, with only one crop a year. But some of the Red Dao are said to be pretty well off. Cardamom, a very valuable crop, grows well around Sapa, and some Dao families own large fields which can produce millions of dong a year. These families can own TVs, bikes and cars. There is a bar/restaurant near the Baguette & Chocolat café at the top end of town called Red Dao House, run eponymously. I had a very good pork and lemongrass there. There are one or two computer terminals in the restaurant and the waitresses use the email when they are not busy. According to the museum of ethnology, the Dao are strongly influenced by Taoism and Confucianism, and use Chinese characters to write poems and ritual texts. 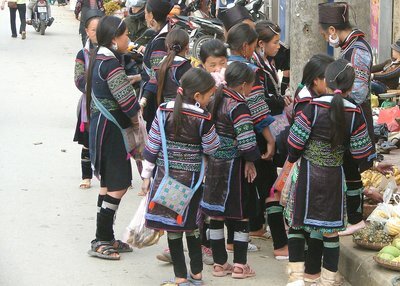 About 5% of the population of Sapa are Day (part of the Thai-Kaday linguistic group). The men wear indigo clothes and a beret. The women wear long indigo dresses, tied with wide cloth belts at the waist. They also wear woollen scarves. There are 75 million speakers of these languages in southeast Asia, and 3.9 million in Vietnam, mainly in the north. They are in Vietnam, China, Laos, Thailand, Burma and India. They probably migrated south from China in ancient times, although they may also have come from northern Vietnam. In VN they worship ancestors, but have also been influenced variously by Buddhism, Taoism and Confucianism. The ethnology museum in Hanoi reported that the Thai and Tay families are related to Mon-Khmer and Vietnamese; but the family relationship is not obvious. 2% are Giai. They are also part of the Tay-Thai ethnic group. There are 25,000 of them in Vietnam, mainly in Tả Van and Lao Chải. They look and dress Chinese, with a short flapped jacket fastened on one side. I’m not conscious of having seen any. Are these people Day or Giai? I'm not sure. 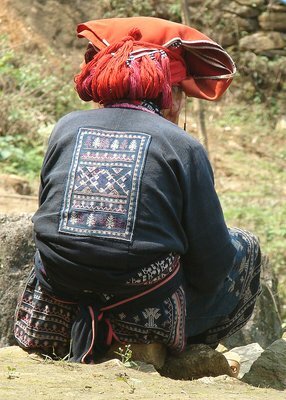 The few remaining people around Sapa are Xá Phó. Apparently the women wear long, tight cotton skirts. They wear a short jacket closed at the chest and decorated with strings of beads. The men wear red-hemmed collars and shirts decorated with crosses and beads on the back. I haven’t seen any. There are only 4,000 Xá Phó in Vietnam. 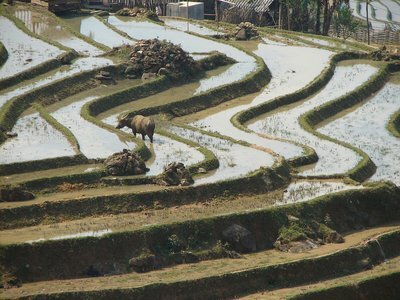 Those around Sapa live in Nâm Sài commune, in the remote southern areas. Some speak Mandarin, others their mother tongue, which is in the Tibetan-Burmese group. The information largely comes from Sa Pa in the Midst of Clouds and from the Hanoi Museum of Ethnology. But if you're confused, so am I. So none, or less, of the above may be true. Light at a wavelength of 600 nanometres is a beautiful colour to the Dutch. Most of the rest of us might think it a bit bright for clothing. 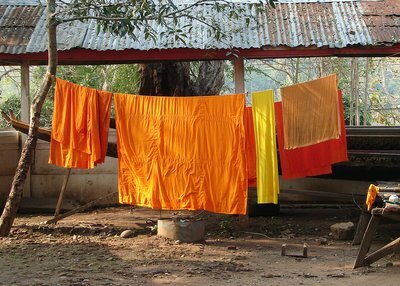 But it is common in Thailand and Laos, and looks great on the monks. 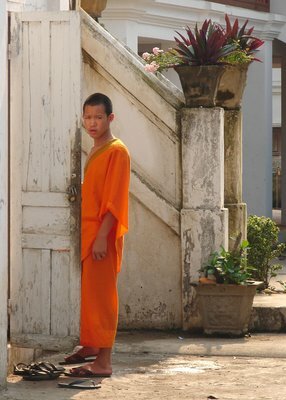 Most Lao boys become novice monks at some point, usually after the death of a relative. 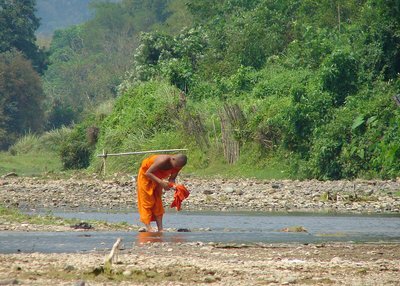 Monasteries are also where a lot of boys go to be educated; monasteries are kept going by daily donations from the Lao population, so the parents do not need to pay. It’s not an easy life: no eating after lunch, for example, and up at 4 am for a spot of chanting. Everyone wants to take monk photos. They must get fed up of being photographed, and it takes a certain insensitivity to photograph them too close. But Buddhists have to seek detachment, and they are not allowed to get angry, so this is a good test, no? Perhaps not. So I’m still searching for the perfect monk shot. This shot of the laundry is the best here, in my opinion, because of the contrast between the orange and the nearly monochrome background. There will be few opportunities here in Vietnam. 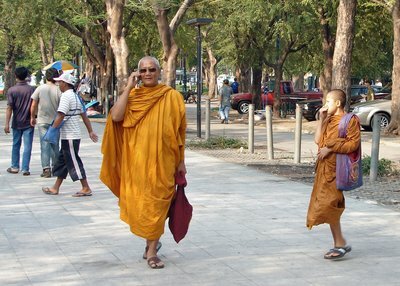 The very few monks I have seen have been robed in brown.